Spring has sprung – the first shipping vessel came to my city recently and the captain reported that there’s barely any ice on Lake Superior, which is totally unbelievable. The shipping season has opened earlier as a result and with surprisingly balmy temperatures, that familiar smell of spring (damp leaves and dog poop) is in the air already! It means we can get the boat out on the lake earlier, which means I can actually share more photos and (finally!) some aerial videos with our drone (last year we launched too late in the season because of repairs). An early spring also means we can start tackling yard work pretty soon too – we just need those last few heaps of snow to melt, but I’m already seeing tons of grass! 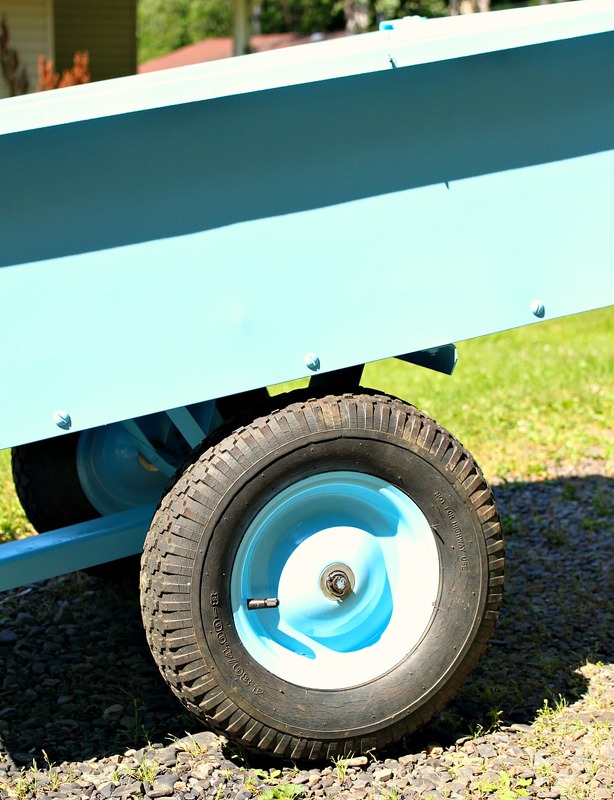 To help move our yard work along, we bought a little utility trailer from Kijiji to use with our riding lawn mower to haul stuff around the property. Wheelbarrows are for chumps. 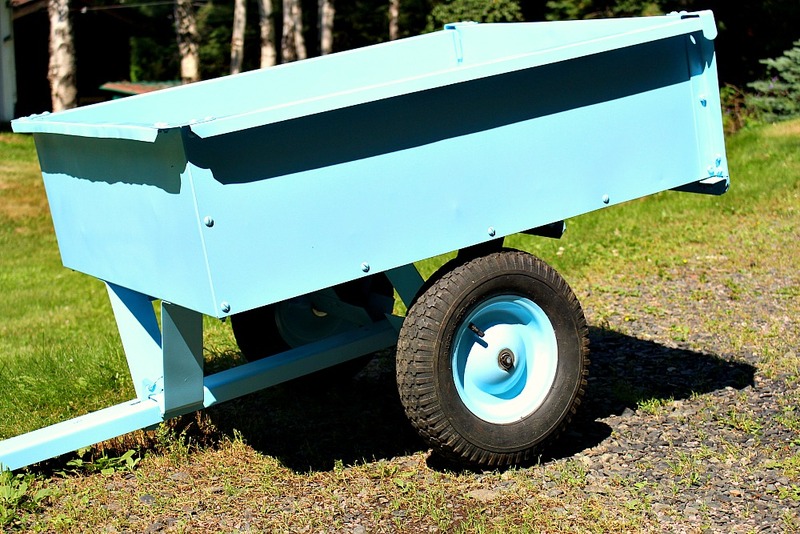 These mini trailers are normally hundreds of bucks (this one is the most similar to our dump cart) but we got this for $80. carrot: “you can paint in turquoise”. Sold. 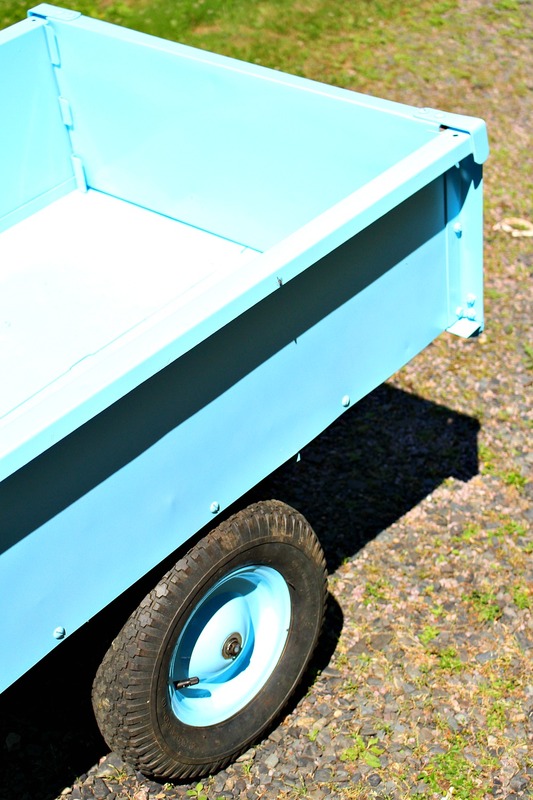 Behold, our new spray painted trailer. So cute! Is that good ol' Charlie in one of the pictures? Oh my goodness, what a good eye! YES, that is Charlie! I was so ready to get rid of him and finally said goodbye but then it was Hubby who put on the brakes, lol. This darn car! I keep trying to convince him to let me saw Charlie in half and make a swing or turn him into a greenhouse, lol. I wasn't creeped out in the least – happy to see someone recognize my little fella. Haha, that would be such a funny dog house – if I created a little A/C system that would actually be pretty darn cute. Do some kind of treat dispenser and watering dish in the dash. Hmmmm….. I love this! As my husband & I were clearing brush & fallen limbs in our yard last week we talked about how much use we've gotten out of our 30 yr old trailer. I think it needs a makeover like yours. 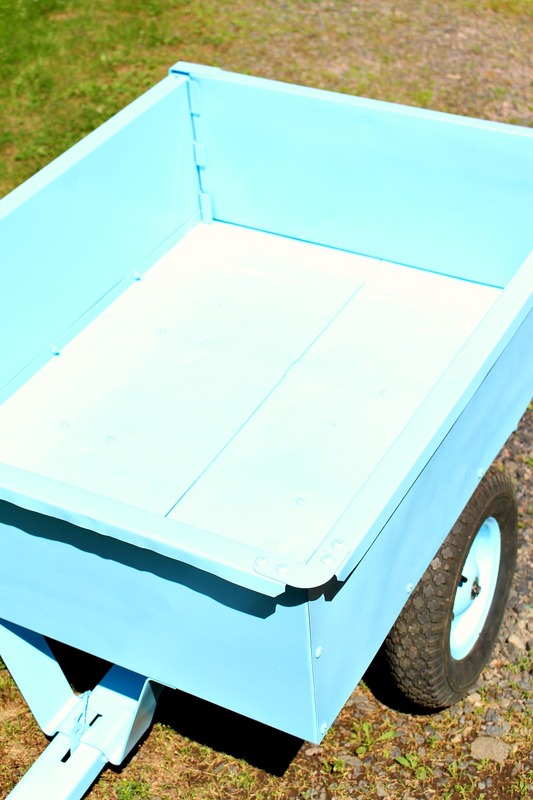 I love that you painted a little work trailer such a beautiful and vibrant colour. It seems very you 🙂 I am to bright green as you are to turquoise. Everything is green, green, green for me. Yay spring is here!! !